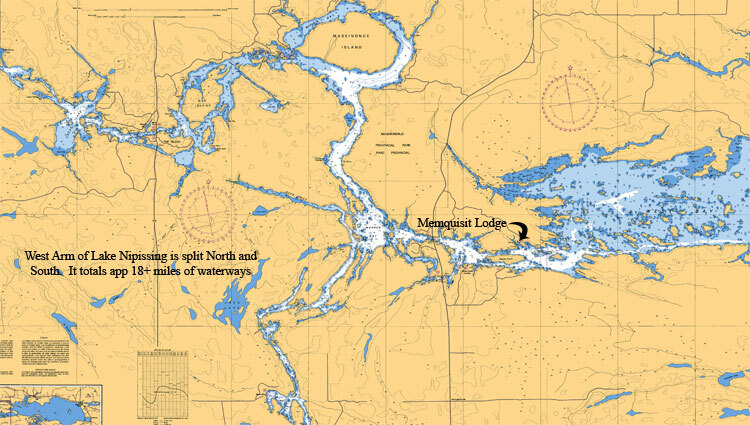 The West Arm of Lake Nipissing located on the west side of Memquisit Lodge is basically very similar to a river system but without the rapids and chutes. The water depth can reach up to 80 feet. The West Arm of Lake Nipissing offers many channels, weeded bays, narrows and small islands to fish from. The entire arm is easily navigable and offers very few obstacles. As per the photo above of the West Arm of Lake Nipissing I have broken up the bay into three different routes. The Northern, Central and Southern Trail. This will enable you to learn and see what all of West Arm has to offer. Please click on the links under each route. Let's breakdown the West Arm into fishing areas, describe them and tell you where and how to fish these honey holes.